Institute of Banking Personnel Selection (IBPS) is one of the most known authority which conducts various exam for different banks every year in which huge number of candidates fill up the form & give examination. Well IBPS is conducting specialist Officer 2019 Exam in which posts like IT Officer (Scale I), Rajbhasha Adhikari (Scale I), Law Officer (Scale I), Agricultural Field Officer (Scale I), HR/Personnel Officer (Scale I) & Marketing Officer (Scale I). Those who fill up the form & clear the exam will be selected by different banks in posts mention above. 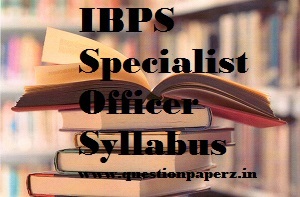 Well for that every candidate has to work hard & prepare for the examination & thus we are providing you IBPS 2019 Specialist Officer Exam Pattern & Syllabus. Written Examination Consists of 200 Marks. Every individual will be given 2 Hour for completing examination. Examination will be objective multiple choice question. Question paper will be Hindi and English except for the Test of English Language. There will one-fourth penalty for every wrong answer. Reasoning: Venn Diagrams, Number Series, Arithmetical Number Series, Input & Output, Coding And De-Coding, Problem Solving Techniques, Statement & Conclusion Type Questions, Arithmetic Reasoning, Non-Verbal Series, Syllogistic Reasoning, Seating Arrangements. English Language: Synonyms, Antonyms, Fill in the Blanks, Comprehension Sentence Error, Sentence Correction& Cloze Test. General Awareness: There can be no assumption for GK as it un-biased section candidates have to read the current events going on National & International Banking, General Knowledge, General Science. Question from marketing can also come in this section & you have read about important dates sports, prizes, technology. IT Officer Scale I: Candidates who will be appearing in IBPS Specialist Officer Exam have to prepare some of the topics from technical. Programming Languages: C, C++, OOP (Objected oriented Programming). DBMS: RDBMS, Normalization, SQL Server, SQL queries, E- R Diagrams, Transaction Management. Data Communication & Networking: Basic Networking Device, LAN, MAN, WAN, Network Architecture, OSI Model, TCP-IP Model, Data Communication & IP Addressing, Bus Structure, Types of Topology- Ring Topology, Bus Topology & Star Topology. Operating System: Process, Thread, Types of OS, Semaphore, Scheduling, Dead Lock, Memory Partitioning, Page Replacement. Network Security: Cyber Crimes, Firewall & Cryptography, Risk Management. Software Development life cycle (SDLC), Software Development Models. Data Structures: Array, Linked List & Stacks. Law Officer Scale I: Candidates who are in this profile need to have detailed study. i am graduted from ece stream..the syllabus for ece stream is same as given above or else? Plz let me know if english reasoning and quantitatives marks are counting in merit or just prof.marks will form merit position. The marks are not counted as per subject, but they are being counted in form of full score obtained in exam. i am b.tech graduate of ECE. is i am eligible for ibps SO(specialist officer). Yes Harini, you can apply for IBPS SO Exam. As pattern is changed this year only professional knowledge marks will be counted for the final selection of interview?? I am forever indebted to you for this help. Hey i hv done b.tech with cs branch .. I m eligible for so exm ryt.. Yes you can give it and to prepare for it refer to the study material we have collated on our website. The cut off for the exam changes every year.